First off, my Echoes of Log Cabins at the Beach... on the bed. This is now in Auckland awaiting the start of the Big Quilt exhibition on Saturday (but the opening event is on Friday). But I just wanted to see what it would look like actually on the bed. Just in case it sells and I never see it again. This is Little Miss Nadia posing at The Country Yard's exhibition... they had quilts draped over all sorts of things... the old car and tractor were great. And these fat eighths just wanted to come home with me. Pick the one Nadia chose. We were both lucky to win spot prizes - amazing since we were numbers one and two. Nadia chose a stitching kit, and I chose the biggest package there - not that I was being greedy, but there was a little voice shouting "pick the biggest one mummy" - so I just had to. I had admired this before... although panels are not really my thing, and something I probably wouldn't have bought myself... but check it out at my house. You couldn't have chosen a better colour scheme. Excuse the mess... these photos definitely weren't staged... just a quick flash of the camera as life went on. And to finish off, a bag of loot from Spotlight. I have a backing in mind for some of this, and the rest is going into the stash cupboard. Because you never know when you might need it! After days of quilting, quilting, quilting and binding, binding, binding I finally finished my Cat quilt, and made it to The Country Yard on Saturday for their annual exhibition. The quilts are shown in Kerryn's beautiful country style house, artfully arranged around the lounge, dining and bedroom areas... with more quilts in the classroom area, and the Challenge entries also on display. My Challenge Sampler Quilt is in the top right hand corner. Unfortunately no prizes... but had lots of fun making it! It is always surprising how the same inspirational items are made into such a diverse group of quilts, well I can't really say quilts because one was a dog coat (see a picture of the lucky owner on the RH side)! Photos courtesy of Love to stitch (stitchingfarmgirl.blogspot.co.nz) - Thanks Raewyn! Nadia and I had a great day out - both winning spot prizes and coming home with a bag of goodies which I'll share another day. Thanks Kerryn and the other great The Country Yard Ladies... Raewyn, Leeanne, and Megan. Those of you who also follow Monika's blog will already know that we have both had quilts accepted into The Big Quilt Exhibition at Northart in Northcote, Auckland (3-23 November). Woot! For those of you who don't follow Monika's blog - well, we've both had quilts accepted in The Big Quilt Exhibition - double WOOT!! So getting it finished had been on the top of the To Do list. I need to make a recording of "but I still need to attach my label" - but I have discovered that I can actually attach a label in the time it takes to get the kids into the car! I have also been busily quilting away on the cat quilt - as another deadline looms for The Country Yard exhibition towards the end of the month. I'm not sure if I'll get it completely finished in time, but I'll give it a damn good go. Each cat and flower block is being quilted identically, in the interests of getting it done - however I am using two different threads depending on the colour of the block. So far, I've almost finished all that I want to quilt in the first thread. The cat backgrounds have a forwards/backward/side to side sort of thing going on. And a bit of swirly hmmm echo quilting around the flower centres... excuse the echo that runs off the edge of the applique - once it's been washed the edges should fluff up nicely and hide such "variations"
and the bodies of the cat have a narrower echo. 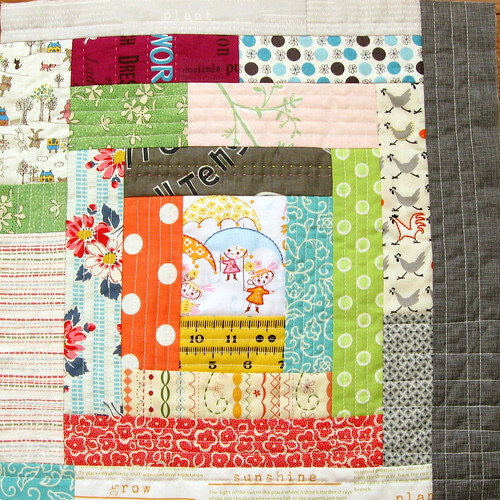 Ellison Lane Quilts is running a scrappy log cabin quilt along... use your scraps... make it up as you go along sort of thing. Quite a loose set of guidelines, but there is a deadline - and would mean making 11 blocks a week (what! don't they realise I have other important deadlines to meet) - but I really like the idea, and I did have "log cabin QAYG" written on my list, after being inspired by Melinda who blogs at Quirky Granola Girl. I pulled a bundle of green and white scraps from my scrap drawers, and quickly laid out a rough draft... I definitely think it will work, although comparing it to Melindas, I need to make my block bigger, and give myself the opportunity to use a whole heap more fabrics. I also want to have an element of calmness, so on reflection, add more whites/neutrals and have the green prints more as accent pieces. The technique Melinda uses involves sewing the log cabin directly onto the batting. Then as each log is added, straight line quilting is added to each piece. Melinda also added hand quilting which looks really nice - and could be a good way of getting started into the whole hand quilting side of things. I really like the effect of straight line quilting - but seem to be more of an organic quilter in real life. I'm hoping this will help me to achieve the look I want. Can't wait to get my teeth into this although judging from the mess I've made so far, and I haven't actually sewn anything yet - it doesn't bode well for the state of my studio! In other news, I was a very naughty girl and added these lovely, drool-able grey fabrics into my cart... but this left room in the international postage bag! Sew Fresh Fabrics is an awesome Etsy store to deal with and put together this custom bundle for me. Luckily these Bella fat quarters filled the gap just nicely. The devil made me do it. My precious... no dribble made it's way onto the fabric. I've just had so many things whirling around in my head at the moment - I needed to write it down (on an actual bit of paper) to keep track of it. Once it had been written down - magically, I could start doing some of it! First up was to piece and quilt my challenge wall hanging. Binding all done. Yay, one thing crossed off the list (although I do still need to sew on my label). This quilting was really good practice for some of my other applique projects. Doing this tight quilting was much harder than expected - and I knew that I was crap at echoing around the shapes. More practice required! Next I needed to put my attention to quilting a raffle quilt for the Kerikeri Guild. Quilting polyester batting is never my favourite task - and even though it isn't the largest quilt in the world (smallish single or largish kids throw) and I did a fairly loose all over pattern, it blunted two needles! Have you ever had problems with this? Anyway, cross that off the list too. This unisex quilt is bright and cheery - although it did do funny things to my eyes! Next is Gail Pan's BOM Block 7 and 8. Once I had Blocks 1 - 6 up on the design wall, I figured it was just as easy to start putting together the last two blocks together, instead of just concentrating on Block 7. It's all about balance, as I decide where fabrics need to be repeated or avoided. Progress is... slow but steady. Once the backgrounds been decided I can add the details at my leisure - when I get sick of doing some of the other things I am in the middle of. See there is progress - I've cut the background pieces! The other major project to rear it's ugly head so to speak - is my Buggy Barn cat quilt. This one has been hanging around for several years now... yeah, it's one of those ones! I finally finished getting it pieced last year and bought a brushed cotton as the backing fabric. As I drove away from the shop, I knew I hadn't bought enough. I washed and dried it - and put it all away. Until yesterday, when I went a bit mental and pieced the backing, and crawled around like a lunatic doing the pin basting. Then I left it (did some circles) and returned to it this morning, ready to put the hopping foot back on and start quilting the devil. It's going to be a long job. Another project that has sat on hold for a while is this one. It's so old it doesn't even have a name. This started as a pattern I really liked in a American Patchwork magazine, but once I'd made the first block - I wasn't really interested in making any more, and wasn't sure what to do with it. So it all sat in it's basket. Then I saw this book - which has 20" blocks, and since my lonely block is 25" I can easily scale it up to fit... now it all has a purpose and I just need to find the time to actually do it! Just needs to be funked up with my funky fabric selection. I am going to do this! It is on my list! Although I do need to give it a name... any suggestions? And last of all, Nadia's had a bit of an image change with the appearance of a fringe! No more hair in the eyes - and it does frame her face beautifully. Whew, it's been a busy Week One of the holidays. I wonder what is going to happen in Week Two? ?